Click ‘View Next’ / ‘View Previous’ to see the next / previous modules. Scroll down to see an overview and the lessons for this module. The improved process now needs to be deployed, or ‘transitioned’ into the new working environment. 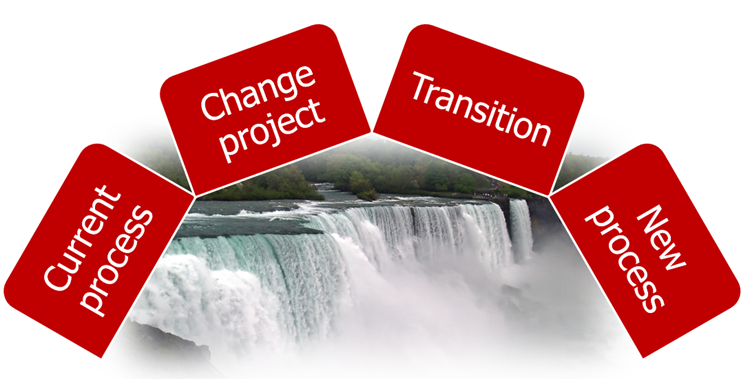 Deployment is the transition from ‘change project’ to ‘operational service’: this point is sometimes referred to as the ‘moment of truth’. It usually lasts a lot more than ‘a moment’. The environment into which the new process is released is sometimes referred to as ‘business as usual’ or ‘BAU’. The greater the number of changes that have been made to the current process, the greater the challenge for the transition. The more business areas that have been effected by the change, the greater the complexity; this is due in part to the interconnections of these areas. The transition stage is about meticulous planning and excellent implementation of the plan. Pilot; Phased; Direct changeover; Parallel run. Four transition strategies are identified. Criteria selection of the most appropriate strategy are considered. Meticulous planning is vital to the successful implementation of processes and related factors. In implementing change it is vital to consider the individual and the corporate culture; the human aspects of change. Lesson 1:Preview – What is Business Process Modelling? Lesson 2:Preview – Why model business processes?